"Recognizing huge potential, the Riddim Twins did what they've done in their 4 decade-career when they find a truly great artist: they crafted a brand new, yet unmistakably TAXI, sound. Along with Chinna Smith (guitar) and Robbie Lyn (keyboards), they created a fresh, 'post apocalypse' reggae sound for the year 3000, applying King Tubby's old-school dub techniques but also the latest modern tricks with Steven Stanley, Jamaica's finest sound wizard (Black Uhuru, Grace Jones, Tom Tom Club). 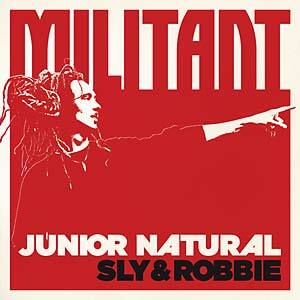 The result, Militant, is the best reggae album in years. It picks up where Sly & Robbie arrived at with Black Uhuru and Ini Kamoze in the 80's. Turbo-charged with attitude, it is super hard and heavy as lead, yet melodic, letting Junior speak with clarity to hearts and minds in times of trouble and confusion."